Nationalism is the belief that your country and ethnic group are superior to all. This was a problem during WW I as well. The Treaty of Versailles gave very strict consequences to Germany. A massive war guilt clause of debt was placed on the nation. Germany also lost imperialistic territories. This was a main source of revenue for the nation, further increasing their problem of paying off the war guilt clause. President Woodrow Wilson felt Democracy would spread after WW I, since the victors were mainly Democracies. This was why he wanted the League of Nations to try and achieve world peace. In fact, to gain support for America joining World War I, he called the conflict, “The War to End All Wars.” Yet, Democracy did not spread to other regions. Massive inflation in Germany crippled their economy and made the citizens of Germany desperate for an answer. In 1924, Vladimir Lenin died. Yet, his Communist revolution continued. Russia was an ally to Britain, France, and the USA in WW I. Afterward, Russia drifted from cooperation with these nations. Joseph Stalin rose as the dictator of the Union of Soviet Socialist Republics (USSR). Industry and agriculture became his main focus. In Communism, the government controlled the economy. This gave Stalin a massive amount of power and took power away from entities that used to be private businesses. Capitalism was removed from Russia. Whenever a dictator rises to govern a nation, the people lose rights and become mistreated. In the Soviet Union, millions of people were viciously murdered and millions of others died from famines while Joseph Stalin was in power. 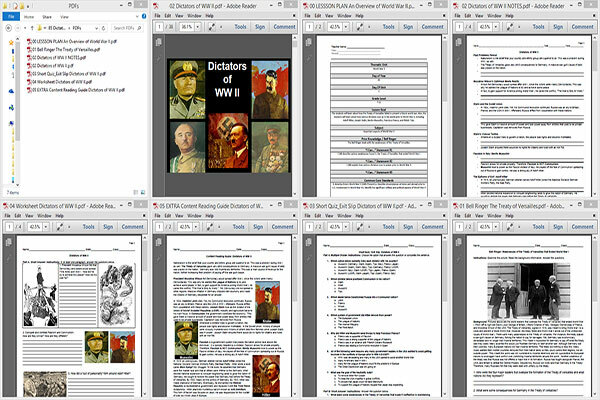 Joseph Stalin ensured there would be no rights for citizens and ruled with an iron fist. Fascism is a government system that places the nation and/or race above the individual. It is typically headed by a dictator. Fascism allows for private property. Therefore, Fascism is NOT Communism. 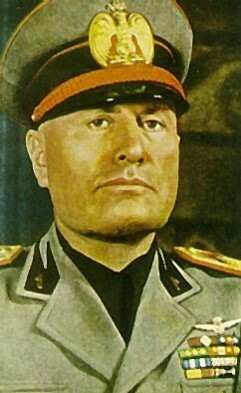 Benito Mussolini rose to power as the Fascist dictator of Italy. He played off the fear of Communism spreading out of Russia to gain control. He was a strong ally of Adolf Hitler. In 1919, an unemployed, German veteran named Adolf Hitler joined the National Socialist German Workers Party, the Nazi Party. Hitler wrote a book called Mein Kampf “My Struggle.” In the book, he asserted that Germans were the master race and that all others were inferior to the Germans. Hitler desired national expansion to conquer neighboring lands to grow the nation of Germany. He sought to restore the power that Germany had before the Treaty of Versailles. By 1932, Nazis led the politics of Germany. By 1933, Hitler was made chancellor of Germany. Eventually, he dismantled the Weimer Republic (a representative government) and replaced it with the Third Reich dictatorship. Hitler practiced murderous racism known as Anti-Semitism. This form of racism was focused on Jews. He was responsible for the murder of over six million Jews in Europe. Hitler’s ideas seem irrational, immoral, and insane. So, why would anyone follow him? He claimed that Jews were the reason for the economic troubles of Germany. This gave the Germans an excuse to deflect blame for their economic problems. The real reason for their failed economy was that Germany lost WW I and could not pay off their WW I debts. Germany’s economy was devastated. The people were desperate and turned to a dictatorship to fix the economy. When people are pushed to the brink of economic disaster, their awareness of morality fades. They become more vulnerable to accepting unethical courses of action. Hitler rose to power because German citizen’s wanted out of economic and political devastation. He committed unspeakable evil once in power. In 1936, Francisco Franco fought against the government and wanted to spread Fascism in Spain. Hitler and Mussolini sent troops to help Franco, since he supported Fascism. By 1939, half a million had died in the Spanish Civil War. Franco emerged as the dictator. Japan desired more land due to being an island nation. In 1931, Japan tried to violently take Manchuria from China to gain more living space. The League of Nations requested that they refrain from this action. Japan quit the League of Nations when they were told to leave the area. Hideki Tojo was the Prime Minister of Japan during WW II and when Pearl Harbor was attacked. WW I was devastating and many in the USA were not ready to send more Americans to die in a European conflict. The USA had the Great Depression to deal with and many were more concerned about the economy. Factors such as these created an atmosphere in the USA in which citizens wanted to avoid war at all costs. When Japan was not stopped by the League of Nations, Hitler and Mussolini felt emboldened and sought to gain more land for their countries. Hitler claimed Germany needed more lebensraum (living space). He began to strategize to gain the Sudetenland in neighboring Czechoslovakia. Mussolini attacked Ethiopia in Africa to gain more land for Italy. Due to actions like these, war was inevitable in Europe. In 1935, Congress, seeing that conflict was coming to Europe, passed the Neutrality Acts that prohibited the selling of weapons to nations at war. Roosevelt did not want Japan to gain sections of China, but national attention was still focused on the economy, which prevented him from intervening. President Franklin Delano Roosevelt began to pursue ways to help and ensure the Allies of the USA, especially France and Britain, were protected.